For Breakfast I prepared a packet of Pioneer Peppered White Gravy. I also toasted a couple of slices of Aunt Millie’s Light Whole Grain bread, fried 2 Jennie – O Turkey Breakfast Sausage Links, and had my Morning Cup of Bigelow Decaf Green Tea. Mom was gone most of the day so I stayed home to keep an eye on Dad. Did some house work and outside got the leaf blower out and cleaned the deck and driveway area off. With everything done I kicked back and watched some shows I had recorded. For Dinner tonight I prepared Reames Chicken and Dumplings and Sliced Carrots. Here’s another one I haven’t prepared in a long time, Reames Chicken and Dumplings. Why i can’t tell you, the Noodle/Dumplings are fantastic to use! While at Meijer I seen a package of these in the Frozen Foods and grabbed a package. To prepare the dish I’ll need; 2 tablespoons Extra Light Olive Oil, 3 Perdue Perfect Portions Boneless, Skinless chicken breasts (cut into 3/4″ chunks), 1 quart (32oz) Swanson Low Sodium Chicken Broth, 1 tablespoon Parsley flakes, 1/2 teaspoon Black pepper, and 1 bag (12oz) Reames Frozen Flat Dumplings. I’m using Perdue Perfect Portions Boneless and Skinless Chicken Breasts. I love using these. Their individually wrapped, perfect size, and cook up perfectly. To prepare it; In a large pot, heat oil, add Chicken and cook until chicken is slightly browned. Add Broth, Parsley and Pepper, Bring mixture to a boil. Add Reames Frozen Flat Dumplings, stirring to separate, return to a boil, reduce heat and simmer 25 min. Stir occasionally to prevent dumpling from sticking. Or until dumplings are desired tenderness. All done, and serve! I’ve got to remember to have these more often! They always turn out so good. Easy to prepare and an excellent Noodle. They go perfect with Chicken. I also heated up a can of Del Monte Sliced Carrots. Just empty the contents into a small sauce pan , bring it to a boil, reduce the heat and simmer until heated through. For Dessert later a Jello Dark Chocolate Pudding topped with Cool Whip Free. 1) In a large pot, heat oil, Add chicken and cook until chicken is slightly browned. 2) Add broth, parsley and pepper, Bring mixture to a boil. 3) Add Reames Frozen Flat Dumplings, stirring to separate, return to a boil, reduce heat and simmer 25 min. Stir occasionally to prevent dumpling from sticking. Or until dumplings are desired tenderness. Serve. 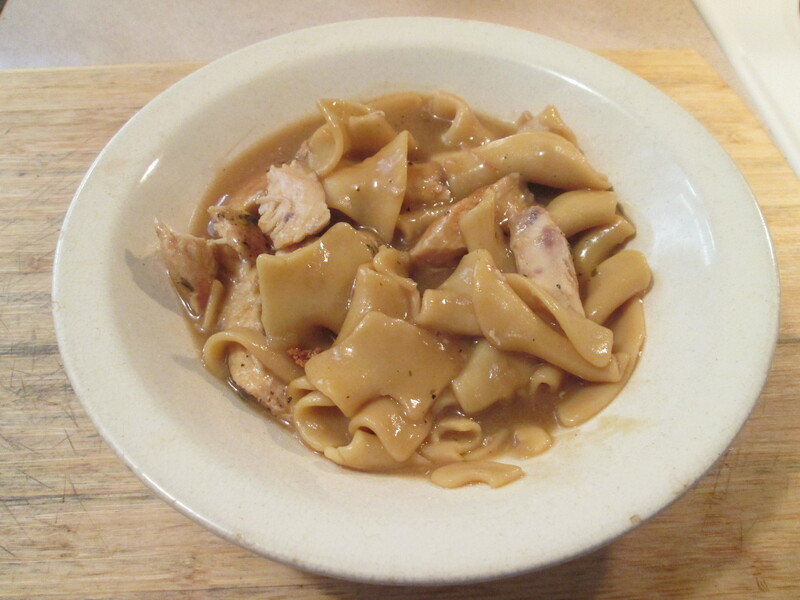 * Easy Old-Fashioned Chicken And Dumplins Recipe. See Back Of Package. * Since 1952 We Have Devoted Ourselves To Making The Best Egg Noodles You Can Buy Fresh-Frozen To Preserve Their Special, Old-Fashioned Goodness. You Can Trust Your Favorite Family Recipes To Reames. We Proudly Prepared This Package Of Reames Flat Dumplins So You Can Make Your Favorite Great-Tasting Homestyle Recipes In Even Less Time. Perfect For Soups And Salads, Casseroles And Main Dishes, There’s Nothing Better. * The Original Frozen Noodle. Cooking Instructions: Bring 4 quarts of water to a rapid boil. Add 2 teaspoons salt, if desired. Add frozen dumplings and return to a full rolling boil, stir to separate. Cook dumplings uncovered for 30 minutes or until desired tenderness, stir occasionally. Drain thoroughly. Dumplings will be tender but still slightly firm. For Soups and Stews: Cook dumplings in broth for the same length of time. Omit salt. Keep frozen. ** The late posting was due to high winds here in the area that brought down power lines. Our area had no internet service until well after midnight. For Breakfast I made my Skillet Potatoes and Ham for Breakfast. I used 1 package of Simply Potatoes Steakhouse Seasoned Diced Potatoes and a package of Meijer Diced Ham to prepare it. Just cook the Potatoes according to the package instructions and with about 5 minutes of cooking time left add the Diced Ham. I really enjoy this for Breakfast. In the 30’s this morning but it was sunny all day and had a high around 50 degrees. Took Mom’s car and had it cleaned and washed and then had to stop by the bank before heading to home. Did some cleaning around the house, straightened up the pantry and the freezer. Pitched a few items out of the freezer. For dinner tonight an easy made comfort food. I prepared Chili and Cheese Nachos. One of those days where something lighter sounded right for dinner so it was Chili and Cheese Nachos! Make a bed of Tostito’s Multi Grain Scoops. Top with Hormel Turkey Chili with Beans, Black Olives, Green Olives, Sliced Jalapenos, all covered up with a blanket of Sargento Shredded Mozzarella. That’s my Dinner Tonight! I used Tostitos Multi Grain Scoops for my Chips. I love these with Salsa or just as snack by their selves, they bake and hold their shape better than most chips. For my toppings I used 1 can of Mario Sliced Black Olives. Anyone that uses small cans of Sliced Black Olives know what a pain they can be opening sometimes. Not these, they come in a can with a pull tab About time! For my other toppings I sliced up some Green Olives, Mezzetta Deli Sliced Jalapeno Peppers, Hormel Turkey Chili with Beans, a few shakes (or more) of Frank’s Red Hot Sauce, and Sargento Reduced Fat Mozzarella. Put all that together and it’s nothing but good! To prepare I preheat the oven at 400 degrees and sprayed a glass baking dish with Pam and layer everything in. I first opened up 2 cans of the Hormel Chili with Beans and heated them up in a sauce pan, as it was heating I added about 6 shakes of Frank’s Hot Sauce to it and mixed. After the Chili was ready I added 4 tablespoons of Chili to the baking dish, then I added my Scoops (Chips). I then added the Sliced Black Olives and Sliced Green Olives, the remainder of the Chili, Sliced Jalapeno Peppers (Love These), and then top everything the Cheese. 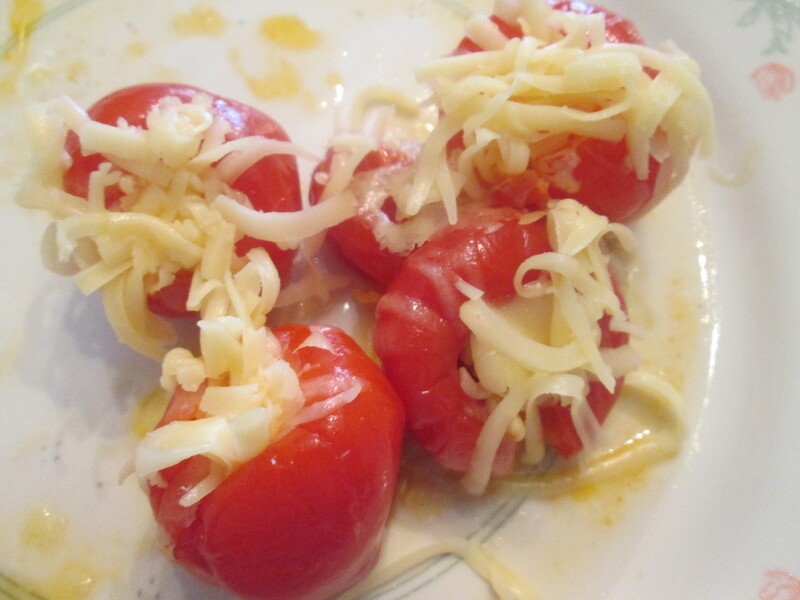 Then just pop it in the oven 10 minutes or so until the Cheese had started to melt and everything heated. I love Nachos, nothing better than a big plate of Chili Cheese Nachos! Also had an ice-cold Diet Dr. Pepper to drink. For dessert later a Healthy Choice Dark Fudge Swirl Frozen Greek Yogurt. Stove top: empty chili into saucepan. Stir occasionally while heating over medium heat, about 5 minutes or until hot. Microwave: empty chili into microwaveable bowl; cover loosely. Heat for 2 To 3 minutes or until hot, stirring once. Careful. Let chili stand in microwave 1 minute and stir before serving. All microwaves And stoves vary. Times given are approximate. Serve up a sensible snacking option with multi-grain tortilla chips at your next gathering using Tostitos Multigrain Scoops! Tortilla Chips, 10 oz. Whether its family Mexican food night or a game night with friends, there are plenty of Tostitos Multigrain Scoops! to go around with this 10-ounce bag. Make a platter or two of individual appetizers to share with guests or for a family weekend snack. The authentic flavor of Tostitos Multigrain Scoops! Tortilla Chips, 10 oz. makes them versatile for pairing with a variety of Tostitos dips. These multigrain tortilla chips and a bowl of salsa are a perfect pair for an evening snack while watching a movie. Spruce up chips and salsa with a dollop of sour cream and some freshly chopped cilantro for a different take on the classic snack. The crunchy texture of the chips makes them a great substitute for crackers with a bowl of chili or soup. Ingredients: Whole White Corn, Vegetable Oil (Contains One Or More of The Following: Corn, Sunflower, Or Soybean Oil), And Salt. For Breakfast I had a couple of Jennie – O Turkey Breakfast Sausage Links and 2 slices of Healthy Life Whole Grain Toast, lightly buttered. After Breakfast did some light cleaning around the house and finished up a load of laundry for Mom. I rarely buy Lottery Tickets but I went this afternoon and purchased some Powerball Tickets for tonight’s drawing of over 800 Million Dollars! They say it could even go much higher before it’s time to draw the numbers. As they say “you can’t win if you don’t play’. Not much else going on today around the house, pretty quiet. For Dinner tonight I prepared a Baked Flounder Sandwich w/ Egg Noodles. While at Kroger a while back I purchased a package of frozen Flounder Fillets. They can be prepared by Baking and can be prepared from frozen or thawed. So I got 2 of the fillets out as I went to bed last night and let them thaw in the fridge overnight. To prepare them I preheated the oven on 400 degrees. I then took a small baking pan lined it with foil and sprayed it with Pam Cooking Spray. Got the Flounder out of the fridge and patted them dry with a paper towel, then seasoned them with McCormick Grinder Sea Salt and Peppercorn Medley along with a dash of Garlic Salt. When the oven was ready I baked the Flounder for about 10 minutes. Not bad for frozen Fish, good flavor and baked up nicely. Just the right size for small Hoagie Buns. I used Aunt Millie’s Deli Style Whole Grain Mini Sub Buns and topped the fillet with McCormick Fat Free Tartar Sauce. For side dish I had planned on Mac and Cheese but my Mom had prepared a bag of Inn Maid Amish Egg Noodles as part of her and Dad’s dinner she had prepared for their dinner, so I just used the leftovers for my dinner. First time I had tried that brand of Egg Noodle and really liked them. I don’t have Egg noodles a lot because of the higher calories and carbs but I hadn’t had any in quite a while so they sounded good. Just reheated them a bit and reseasoned with Morton’s Lite Salt and Ground Black Pepper along with a pat of I Can’t Believe It’s Not Butter. Enjoyed the meal tonight, bit of an odd combo but enjoyed it! For dessert later a Jello Sugar Free Dark Chocolate Mousse. Inn Maid® Medium Egg Noodles are made in the heart of Ohio Amish Country. They are perfect for side dishes, entrees, soups and casseroles. Available in 8oz. and 16oz. packages. SERVINGS PER CONTAINER: about 8 for 16 oz. SERVINGS PER CONTAINER: about 4 for 8 oz. Had a light Breakfast and then we had to get Mom’s car to the mechanic’s. Last week my brakes went out , busted brake lines, and this week her’s went out. What are the odds the same thing happening to both cars! Expensive, but has to be repaired. . Beautiful day out, sunny and 70. Got the cart out around noon enjoyed the beautiful day. For dinner tonight I prepared Chicken ‘n’ Noodles w/ Baby Carrots. 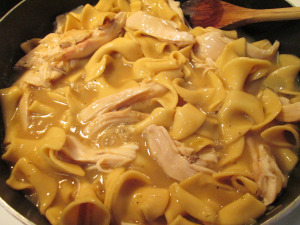 I used Margaret Holmes Simple Suppers Chicken n Noodles Fixins’.One of my favorite Comfort Foods! I used to buy this at Walmart all the time but Margaret Holmes no longer makes it, lack of sales they say. So now I purchase it on-line from different sites, last of their stock. Anyway it comes in a 5 serving can and contains the Noodles and Seasoning, I added the Chicken. I cut up 2 Perdue Perfect Portions Chicken Breasts seasoning them with Sea Salt, Ground Black Pepper, Ground Smoked Cumin, and Parsley. I then fried them in a large skillet, on medium high, until done. When ready, removed them from the pan on to my cutting board. Shredded and cut the Breasts into small pieces. Added the can of Fixins’ to the skillet along with the Chicken. Cooked until it the Sauce was bubbling reduced the heat to low simmered until it was heated throughout. The broth that’s with Noodles is incredible! Rich and thick and seasoned just right. The best Chicken and Noodles, bar none! I’ve got 6 cans of this left and that will be the end of it, I checked on-line and all the sites are now sold out. I also had of side of boiled Baby Carrots and a slice of Aunt Millie’s Wheat Bread. For dessert later a Jello Sugar Free Dark Chocolate Mousse. 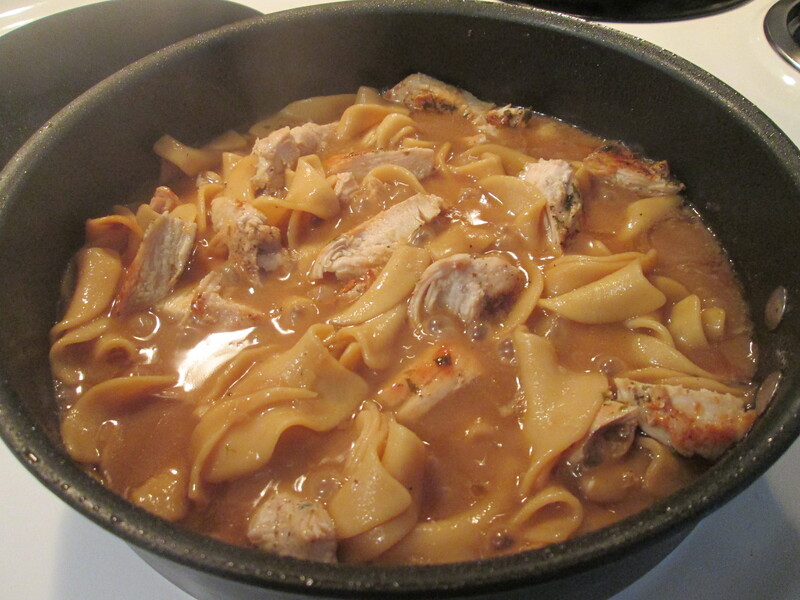 Chicken n’ Noodles will become a comfort-food favorite in any household. Add boneless, skinless chicken breast to a can of Simple Suppers Chicken n’ Noodles, which is filled with plump noodle dumplings and special seasonings. It’s been one hectic day today! My Dad had a doctor’s appointment but before that this morning I had to call 911. He was really struggling getting his breath, a nagging cough was turning worse, and was really weak. I wanted him to go to the doctor a week ago but as usual when I try to help it goes upon deaf ears. And now this is the result, he’s in the hospital with pneumonia. Then on top of that my Mom’s get a cold and I’ve got my yearly Pre – Spring Sinus Infection. It’s not been a good day to say the least. It’s been a warm day a high near or at 60 degrees, and they’re calling for 64 degrees tomorrow! Then back to back cold days with possible flurries, no wonder everyone is sick! Well thank goodness for leftovers, because it was Leftover City tonight for dinner! , I reheated Chicken ‘n’ Noodles w/ Sliced Carrots and a Slice of Whole Grain Bread. 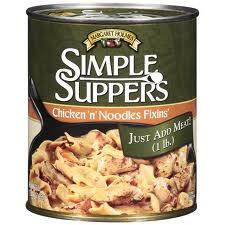 Just to jog the memory, I used Margaret Holmes Simple Suppers Chicken n Noodles Fixins’. Another of my favorite Comfort Foods! I used to buy this at Walmart all the time but Margaret Holmes no longer makes it, lack of sales they say. Anyway it comes in a 5 serving can and contains the Noodles and Seasoning, I added the Chicken. I cut up 2 Perdue Perfect Portions Chicken Breasts seasoning them with Sea Salt, Ground Black Pepper, Ground Smoked Cumin, and Parsley. I then fried them in a large skillet until done and added the can of Fixins’. Cooked until it the Sauce was bubbling and heated throughout. The broth that’s with Noodles is incredible! Rich and thick and seasoned just right. I also had of side of Boiled Sliced Carrots leftover that I warmed up and a slice of Klosterman Wheat Bread, that I buttered with I Can’t Believe It’s Not Butter. Then for dessert later tonight a Healthy Choice Dark Fudge Swirl Frozen Yogurt. Somewhat cooler out today, high in the low 40’s where it’s been in the mid 50’s lately. But not a bad day, sun finally came out in the early afternoon. 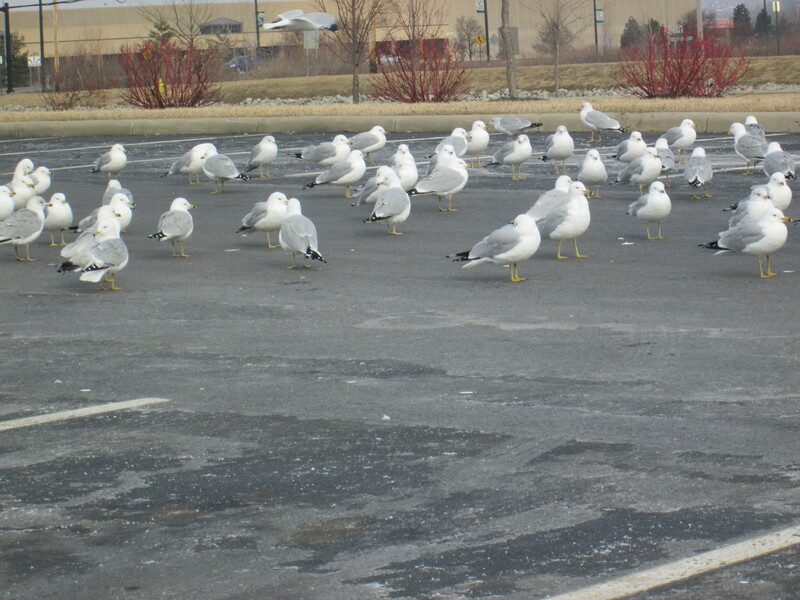 Went to the store to pick up a few items and on my way home seen something I don’t believe I ever saw around this area, Seagulls. At least they looked like Seagulls, I compared my picture with some on-line and that’s what they look like. They were in a field and the parking lot of the West Chester Public Library, where there’s always a big gathering of Geese. And the Geese were none too happy about the new guests in their territory! Not sure on why they were settled in here, there was about 3 good size flocks of them. Anyway tonight for dinner it was Chicken ‘n’ Noodles w/ Sliced Carrots and Whole Grain Bread. I used Margaret Holmes Simple Suppers Chicken n Noodles Fixins’. Another of my favorite Comfort Foods! I used to buy this at Walmart all the time but Margaret Holmes no longer makes it, lack of sales they say. Anyway it comes in a 5 serving can and contains the Noodles and Seasoning, I added the Chicken. I cut up 2 Perdue Perfect Portions Chicken Breasts seasoning them with Sea Salt, Ground Black Pepper, Ground Smoked Cumin, and Parsley. I then fried them in a large skillet until done and added the can of Fixins’. Cooked until it the Sauce was bubbling and heated throughout. The broth that’s with Noodles is incredible! Rich and thick and seasoned just right. I left the info and web site link to Margaret Holmes at the end of the post. 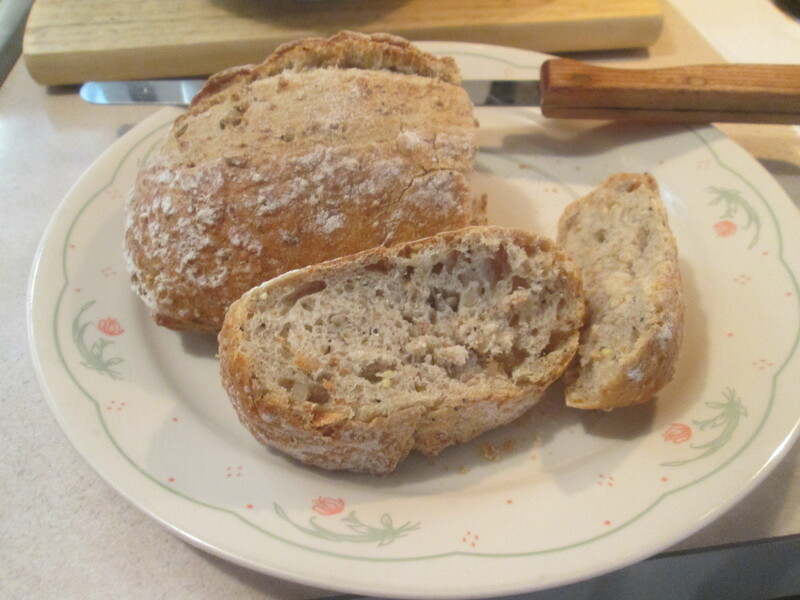 I also had of side of Boiled Sliced Carrots and a slice of Klosterman Wheat Bread. Then for dessert later tonight a Jello Sugar Free Double Chocolate Pudding topped with Cool Whip Free. Had a slight case of the dreaded Cabin Fever, so it was time to get out! Stopped by the bank to start and then to one of my favorite stores to shop or just browse, jungle Jim’s International Market! The store is just amazing! The Deli has the best selection of Boar’s Head Meats and Cheese of anyone. A fantastic Olive and Side Dish case and the best Cheese selection of anyone. The Produce, Bakery, Meat , and Seafood departments are all top-notch also. Then the International selection of all World Foods can not be topped, at least in this area. So whether it’s Crabs, Geoducks, Polenta, or Quail or Ostrich Eggs they have it. While there I purchased some Oranges, Bananas, Calf Liver (for my Mom), Boar’s Head sliced Rare Roast Beef and sliced Honey Smoked Turkey, Snapple, and a couple of different Blue Cheese and Cheddar. Love that Store! For dinner tonight I prepared Chicken ‘n’ Noodles w/ Sliced Carrots and Whole Grain Bread. I used Margaret Holmes Simple Suppers Chicken n Noodles Fixins’. Another of my favorite Comfort Foods! I used to buy this at Walmart all the time but they no longer carry it so I came across some for sale on the Amazon web site so I purchased 8 cans of it. I’m wondering if Margaret Holmes is going to discontinue making it? Anyway it comes in a 5 serving can and contains the Noodles and Seasoning, I added the Chicken. I cut up 2 Perdue Perfect Portions Chicken Breasts seasoning them with Sea Salt, Ground Black Pepper, Ground Smoked Cumin, and Parsley. I then fried them in a large skillet until done and added the can of Fixins’. Cooked until it the Sauce was bubbling and heated throughout. The broth that’s with Noodles is incredible! Rich and thick and seasoned just right. I left the info and web site link to Margaret Holmes at the end of the post. I’m pretty sure to predict the weather they write down all the possibilities, put them in a hat, and pull one out for our forecast! They had predicted 2 1/2″ to 3″ of rain and a front to move through and move out all the humidity, wrong. We did get a couple of brief cloud bursts of rain but not close to the amount they said and it’s still humid! Never trust the weather report. Tried a couple of new dishes for dinner, one I wasn’t real sure on but it turned out to be a keeper of a recipe! I prepared some Whole Grain Noodles Topped w/ Turkey Meatballs in a Brown Mushroom Gravy and a Stuffed Peppadews Appetizer. The Whole Grain Noodles Topped w/ Turkey Meatballs in a Brown Mushroom Gravy is loosely based on a Rachael Ray dish that I had seen earlier on TV. I did a few things to shorten the cooking and prep time and I also lightened it up, fewer calories and carbs. 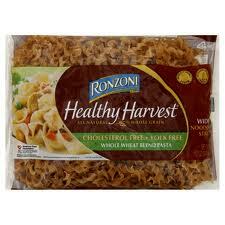 I used Ronzoni Health Harvest Whole Grain Noodles. I love Egg Noodles but I always try to stay with the Whole Wheat when possible. As I was boiling my Noodles I went ahead and started preparing the Meatballs and Gravy. I found some Jennie – O Turkey Meatballs at Jungle Jim’s Market a while back and them frozen waiting to try them with a Meatball Dish. First time I’ve tried the Jennie – O Turkey Meatballs, I usually use Honeysuckle White Turkey Meatballs. These were 10 fewer calories per serving, they’re not quite as big as the Honeysuckle White’s though but every bit as good! 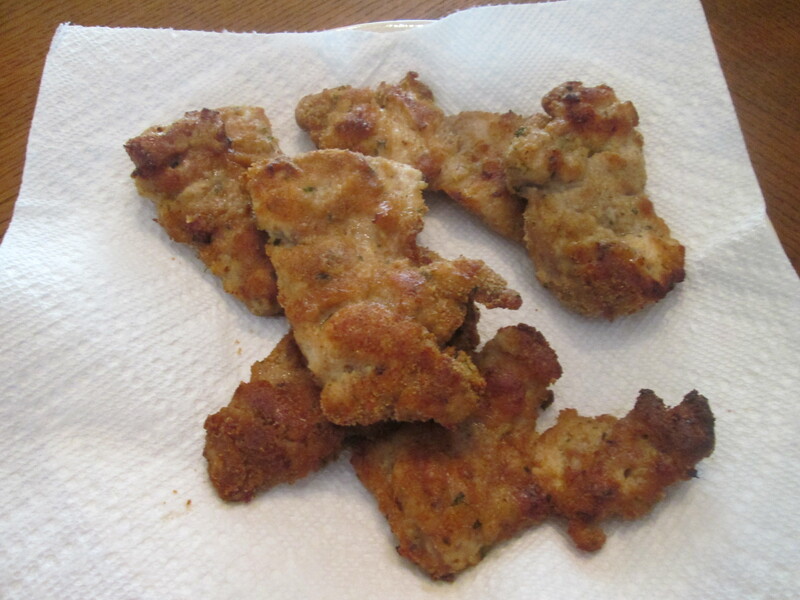 I pan fried them in a 1/2 tablespoon of Extra Virgin Olive Oil and took them off the heat before they were quite done. Then in another skillet I heated up my Heinz Mushroom Gravy, I had added additional sliced baby Bella Mushrooms to the gravy. As the gravy was heating I added my Meatballs and let them simmer in the gravy until heated through. First time I had ever had Turkey Meatballs in a Mushroom Gravy and it was as they say “Off the Hook”! What a great combo. My Noodles were just finishing up as my Meatball/Gravy mix was. To serve I made a bed of the Noodles and topped it with the Meatballs/Gravy. I then topped it with some freshly grated Asiago Cheese and fresh chopped Parsley. What a hearty comfort food! A keeper recipe. Everything just seemed like a natural pairing and the Asiago Cheese was the perfect topper. I also baked a mini loaf of Kroger Bakery Harvest Grain Bread. For an appetizer another new one with Peppadew Peppers, which I had never heard of until this morning when I was at Kroger doing some early morning shopping. They had these in the Deli/Cheese Shop already seeded and marinated. There was 6 whole ones and 2 small ones in the container. I stuffed 3 of them with fresh grated Havarti Cheese and the other 3 with Turkey Sausage and Havarti Cheese. After stuffing them I put them in a microwave plate and heated them for about 40 seconds. I love them! Wasn’t sure how they would turn out but they came out a winner. A good appetizer to have around. For dessert later a Healthy Choice Chocolate Swirl Frozen Yogurt. 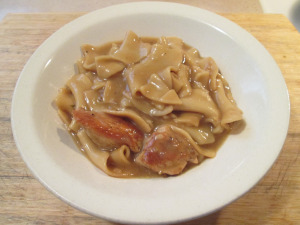 Whole Grain Wide Noodles are short flat pasta strips made with eggs. Whole Grain Noodles come in wide or extra wide. Whole Grain Wide Noodles are best in soup, entrées, side dishes or oven bakes. Cream or cheese sauces, gravy, light tomato sauce or simple butter (or olive oil) tosses are complementary. Durum whole wheat flour and semolina blend, wheat fiber, egg whites, thiamin mononitrate, niacin, riboflavin, iron (ferrous sulfate), folic acid. This type of piquante pepper was first discovered in early 1993 and introduced to market later that same decade. The name is a portmanteaux of pepper and dew. Although the pepper is sometimes described as a cross between a pepper and a tomato, this description is not botanically accurate, and refers only to the resemblance in color and size between peppadew and cherry tomatoes. Applications have been made by the various owners of the brand to secure international breeders right by application to the UPOV. In 2000 the South African mushroom producer, Denny Mushrooms, acquired the Peppadew brand and business. Denny has in turn since been acquired by AVI. The fruit is processed for removal of the seeds and reduction of the heat of the pepper to more pleasant levels. It is then pickled and bottled. 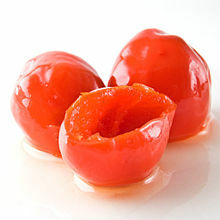 The flavor of the Peppadew fruit is sweet, with mild heat of around 1,177 on the Scoville scale. Really couldn’t figure out just what to have for dinner or even something that sounded good. Searching the kitchen I found a box of LaChoy Creations Sweet Sesame Chicken, I had found dinner! It’s the first time I tried the Sweet Sesame Chicken, I had tried the Sweet and Sour Dinner. The dinner kit comes with 1 Can Pineapple and Red Peppers in a sweet sesame sauce and 1Packet of pre-measured Noodles. I added 1 lb. 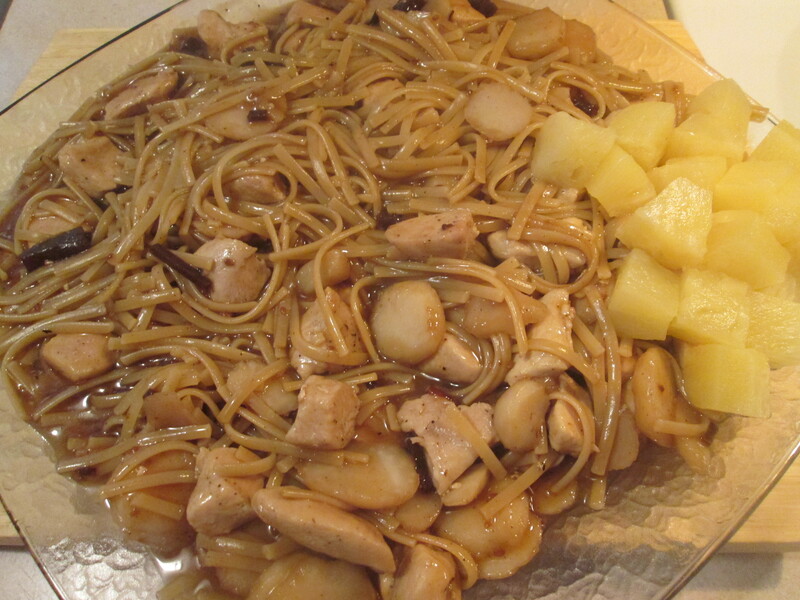 of boneless and skinless Chicken Breasts that I cut into 1/2″ pieces, 1 Can of La Choy Sliced Water Chestnuts, 2 tbsp. Extra Virgin Olive Oil, and 2 1/2 cups water. To prepare it is quite easy. Basically first fry your Chicken, remove it from the pan when done. Add your water and Noodles, cooking 10-11 minutes. Then add the Sauce and add the Chicken, heat 1-2 minutes. Let stand 3 minutes before serving. I’ve left the full instructions at the bottom of the post. I added a can of Dole Pineapple Chunks for a side. This makes one delicious and hearty meal! The seasoning and sauce are awesome. Another great dinner from La Choy! For dessert later a Jello Sugar Free Chocolate Pudding topped with Cool Whip Free. La Choy Creations Sweet Sesame Chicken features tangy pineapple and zesty red peppers in a savory sesame sauce atop tender noodles. Simple to prepare, yet complex in delectable flavors, it’s bound to become a family favorite. Stove top skillet directions: for non-coated skillets, sprayskillet with cooking spray or add one tablespoon vegetable oil beforepreparing. 1) cut 1 lb. Boneless, skinless chicken breast into 1/2 inchpieces. Heat 10-inch nonstick skillet over med-high heat. Add 2tablespoons vegetable oil To skillet. Add chicken And cook 6 To 7minutes or until chicken reaches an internal temperature Of 165ºf.remove chicken From skillet; set aside. 2) add 2-1/2 cups water andnoodle packet; bring To boil. Cook 10 To 11 minutes or until water hasevaporated, stirring occasionally. 3) stir in sauce And cooked chicken.Heat 1 minute or until warmed. Remove From heat. Let stand 3 minutes. 4)check that product is cooked thoroughly. Internal temperature needs toreach 165ºf as measured by a food thermometer. Refrigerate or discardany unused portion. For food safety And quality: use thawed chicken;stove top burners And skillets may vary. Adjust cooking times as needed;product must be cooked thoroughly. Read And follow these cookingdirections. Today’s Menu: Baked Buttermilk Mustard Chicken Thighs w/ Egg Noodle Fettuccine, Sauteed Mushrooms, and Baked Multi Grain Loaf Bread. Well it looks as though my Dad will be coming home Saturday, barring no setbacks, from the rehab center. It will be nice to have home again! Really had no idea on what to have for dinner. I went to Kroger to pick up some Milk and Bread and came back with everything to make dinner tonight. Kroger had Chicken Thighs on sale and I knew I had found dinner! I had never tried any recipes with Chicken Thighs but I keep hearing on the cooking shows on TV on how good they are I thought I would give them a chance. 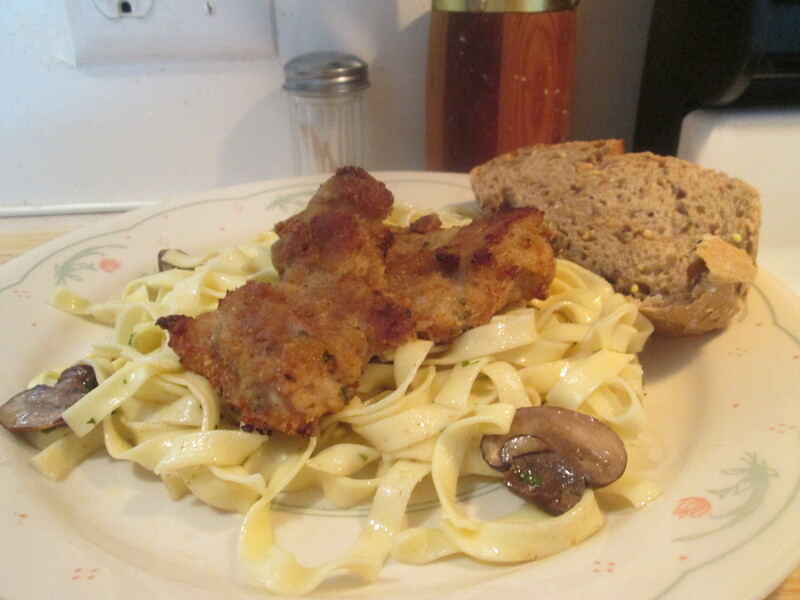 For dinner I prepared Baked Buttermilk Mustard Chicken Thighs w/ Egg Noodle Fettuccine, Sauteed Mushrooms, and Baked Multi Grain Loaf Bread. I found the Baked Buttermilk Mustard Chicken Thighs on-line at http://www.food.com/. Very good website stocked full of all kinds of recipes. To prepare the marinade for the Chicken I’ll need; 1/4 cup dry breadcrumbs, 2 tablespoons grated parmesan cheese, 1 teaspoon dried minced onion flakes (optional), 1/2 cup buttermilk, 2 tablespoons Dijon mustard, 2 teaspoons honey, 1/2 teaspoon sea salt, 1/4 teaspoon pepper, 1/2 teaspoon garlic powder, 1/4 teaspoon dried rosemary, 1/4 teaspoon dried ground sage, and 6 chicken thighs, skinless and boneless. I first preheated the oven to 425 degrees F. I then combined the bread crumbs, Parmesan cheese; set aside. Combined the buttermilk, Dijon, honey, salt, pepper, garlic powder, rosemary, and sage. Then coated the thighs in one portion of the buttermilk mixture, then dredge in the bread crumbs; and discarded any used buttermilk or breadcrumbs that were left over. Placed the thighs on a plate so that they are not overlapping and let chill in refrigerator for 20 minutes. Coat a baking sheet with cooking spray and place in oven for 5 minutes to preheat the sheet; place thighs on the sheet and bake for 24 – 30 minutes, turning the pieces over half though the baking time. We have another keeper recipe! The Chicken Thighs had just an incredible flavor from all the ingredients and Buttermilk along with a nice crunch to them from the Bread crumbs. To go with the delicious Chick Thighs I prepared some Al Dente Egg Fettuccine Noodles, Sauteed Baby Bella Mushrooms, and baked a loaf of the La Brea Bakery Take and Bake Artisan Multi Grain Loaf. Everything together made one fantastic dinner! 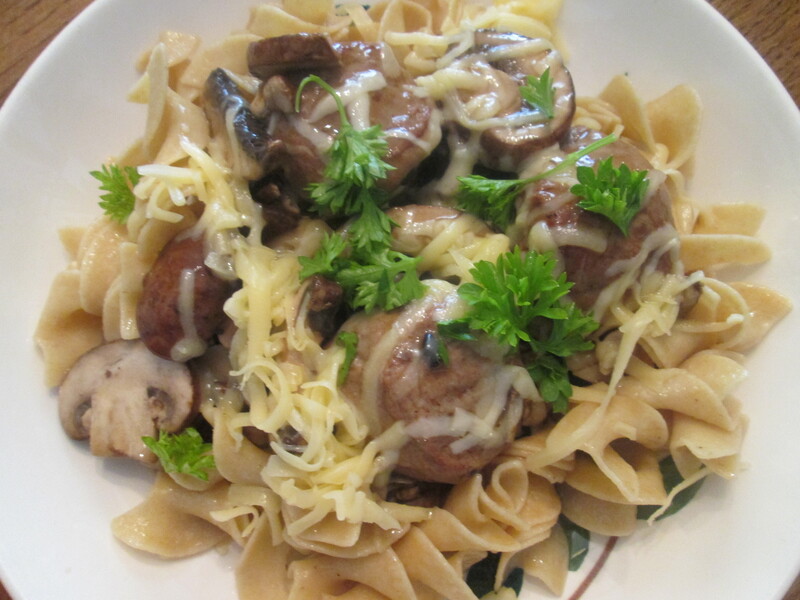 To serve it I added the Mushrooms to the Pasta and served the Chicken Thighs on top of a bed of Pasta. For dessert later a Banana! Not a Banana Split or Bananas Foster, a Banana. They had them on sale at Kroger! Combine bread crumbs, Parmesan cheese, and dried minced onion; set aside. Combine the buttermilk, Dijon, honey, salt, pepper, garlic powder, rosemary, and sage. Divide mixture into two portions and set one portion aside. Coat the thighs in one portion of the buttermilk mixture, then dredge in the bread crumbs; discard any used buttermilk or breadcrumbs that are left over. Place thighs on a plate so that they are not overlapping and let chill in refrigerator for 20 minutes. Coat a baking sheet with cooking spray and place in oven for 5 minutes to preheat the sheet; place thighs on the sheet and bake for 24 minutes, turning the pieces over after 12 minutes. To serve, microwave the reserved, unused buttermilk mixture on high for about 20-30 seconds or until warmed through, and drizzle as a sauce over the chicken. Satisfying, hearty and wholesome. The sweet and nutty flavor combination delivers a perfect taste. UNBLEACHED ENRICHED FLOUR (WHEAT FLOUR, MALTED BARLEY FLOUR, NIACIN, REDUCED IRON, THIAMINE MONONITRATE, RIBOFLAVIN, FOLIC ACID), WATER, WHOLE WHEAT FLOUR, SOUR CULTURE, FLAX SEEDS, SUNFLOWER SEEDS, MILLET, RYE FLOUR, SALT, YEAST, SUGAR, WHEAT BRAN, CANOLA OIL, WHEAT GLUTEN, WHEAT FLOUR, CULTURED WHEAT FLOUR, GUAR GUM, GUM ARABIC, WHITE DEGERMINATED CORN MEAL, CARAMEL COLOR WITH SULFITES. Perfect for any occasion, any recipe, whether it is chicken soup, fettuccine alfredo or simply pasta with fresh tomatoes, olive oil and Parmesan cheese. Parents from all over the country write to us saying that even their kids can tell the difference between Al Dente Egg Fettuccine and others. That makes us feel so good!